This 3 oz. 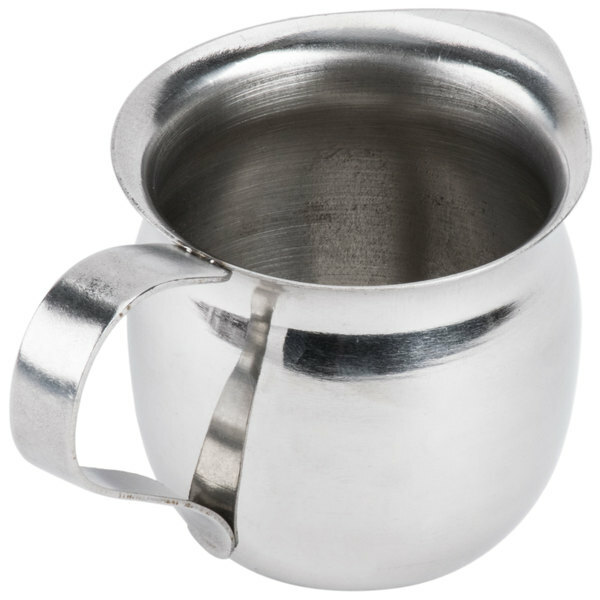 stainless steel bell creamer offers consistent pouring capabilities and lends a classic appearance at any establishment. Be sure to keep enough creamers on hand so your guests can add the fresh, cool taste of cream to any piping hot cup of coffee. Compared to other types of creamers, stainless steel creamers add sleek and shine to any tabletop presentation. 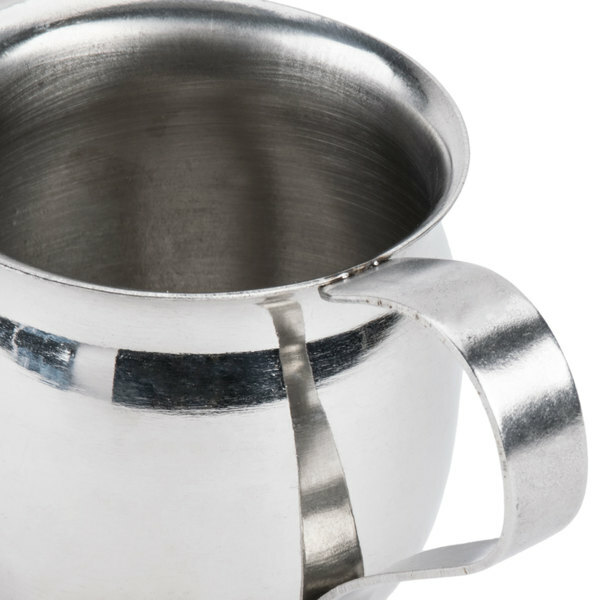 Thanks to the classic design, this bell creamer is perfect for use at any restaurant, cafe, or hotel. "Easy to clean and they stay odor free. An important thing when it comes to creamers. They have held up well over time and the price is good." 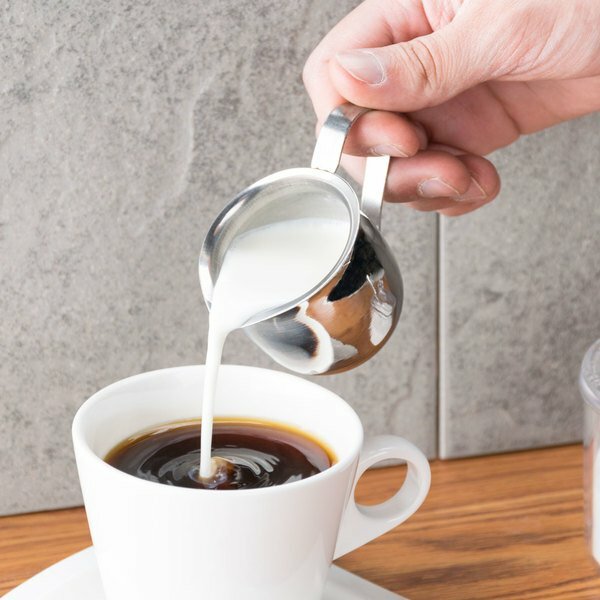 Its rounded, tapered spout provides a consistent pour, while the ergonomic handle makes this creamer convenient for all of your guests to use. 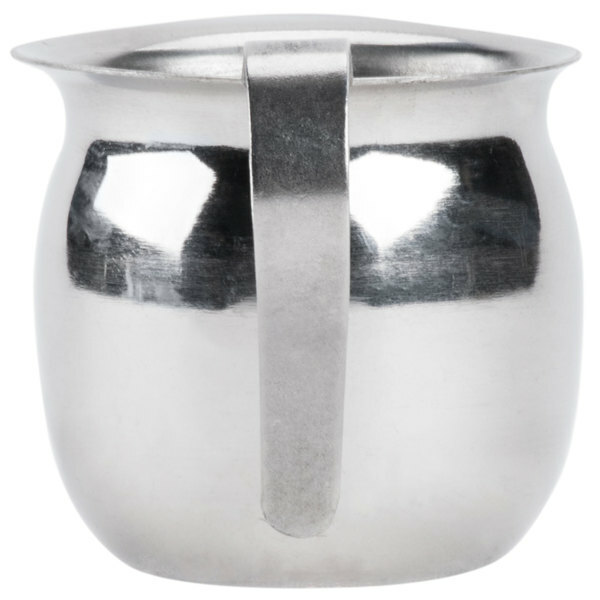 Made of sturdy 18/8 stainless steel, this creamer features a sleek mirror finish that suits any setting, from diners to catered events. Its petite 3 oz. design holds just the right amount of creamer to be served at one sitting. This vessel can be used for more than just creamer. 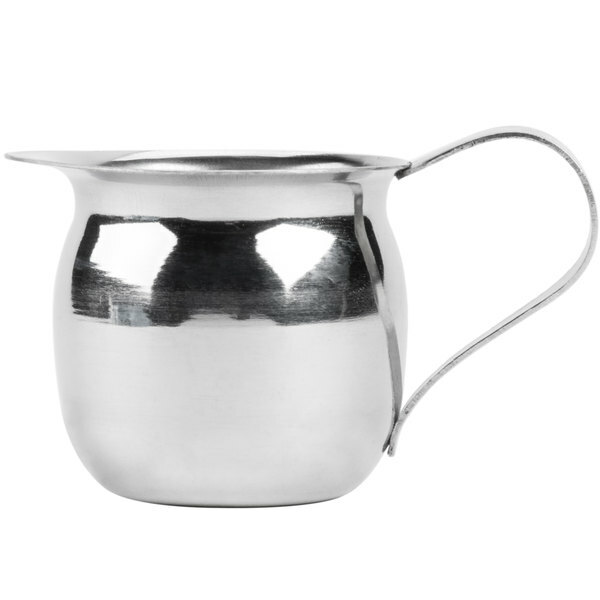 Use it for house salad dressings, signature gravies, or rich sauces during tableside service. It can also be used for sticky-sweet syrup when serving pancakes, waffles, or french toast. great looking product. this was exactly what I was looking for. great for espresso shots. I would definitely buy again. You will be glad you purchased this. These little containers are so cute! Just the perfect size for a small amount of creamer for just one or two people, so no waste. Love that they are not ceramic and don't break easily. These steel bell creamer cups look classy, but the cost is cheap enough not to worry when you lose them. They pour effectively without spilling any cream along the sides. These little cups are great at holding creamer, they hold the perfect amount and look great. 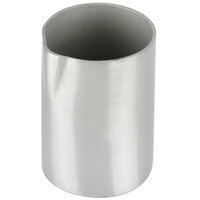 These cups can easily hold cold and hot liquids! I just love these little creamer pitchers! They are very versatile - we use them for sauces on the side of belgian waffles: maple syrup, hot fudge, peanut butter sauce, caramel sauce, & strawberry syrup. We also use them as a creamer pitcher with coffee or tea. This little creamer was the perfect size for sugar. We added a small spoon and it was just the right amount of sugar for the whole family to have a couple cups of tea each. Nice stainless steel means it is pretty, too! 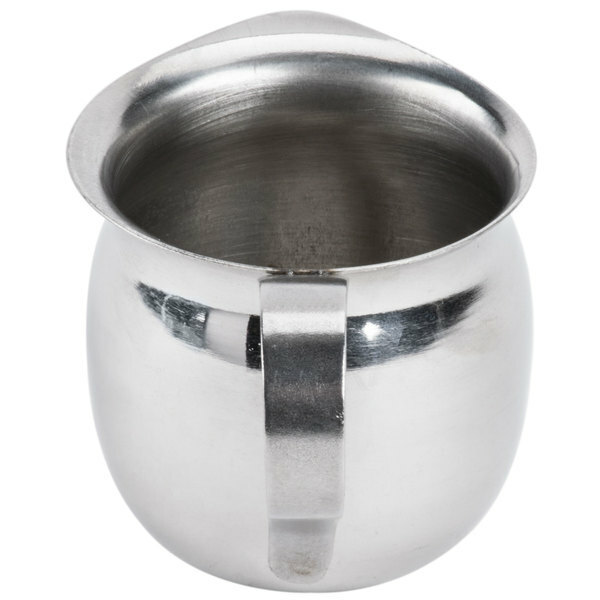 This stainless steel bell cup creamer is very light weight and is very easy to add milk and the style is very nice. I love this style and is my favorite. I do recommended very much. 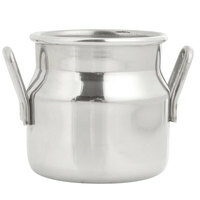 These stainless steel bell creamers add a nice touch to any table whether it's classy or casual. The 3 oz. size is great for not only creamer, we also use them for single serve sauces and other liquids. These creamers are the perfect size for dream for 1 or two people drinking coffee or tea. The stainless option looks great in our wine bar. These bell creamers work great for dairy products. The only thing I did not like is the stickers which were hard to get off before using them. These creamers are cute, simple, easy to clean and work well for our needs. They aren't fancy but are a good price and are perfect to serve with coffee at the end of a customer's meal. So I ordered this for our creamer and I wasnt quite sure what I was looking for. This came in and is VERY small but does the job. It's a super cute little holder. These little creamer jars work great for use with our espresso machine. I used to work at Caribou coffee and these are almost identical to the ones they use. The perfect shape to get under the machine and to pour the espresso into cups. These are great little creamers. We use them alongside cups of coffee and tea. They are sturdy, easy to clean, and look nice. We will be buying again! 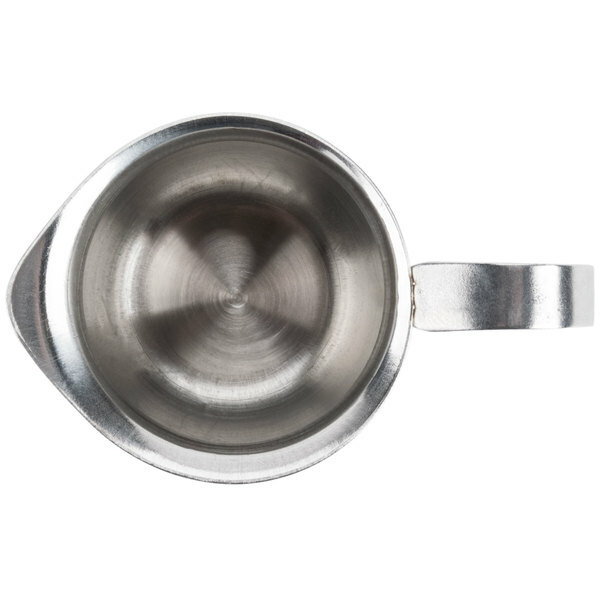 This is a smaller version of a bell creamer that we use for side sauces. The three ounce creamers actually only hold two ounces of liquid- so know that going in. 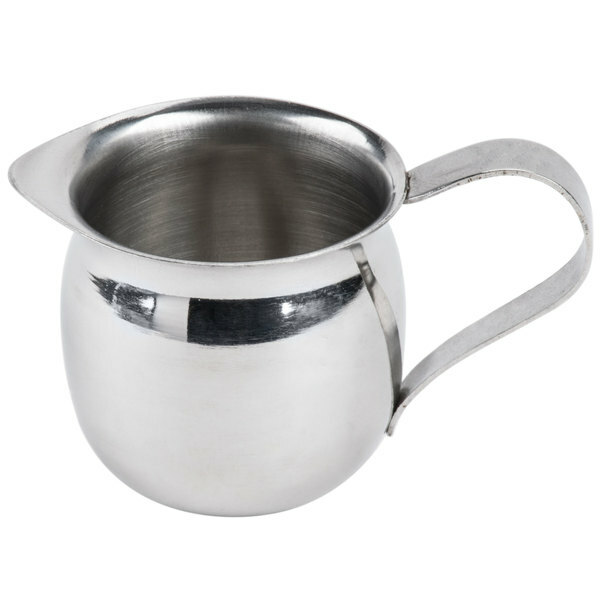 3 oz stainless steel bell creamer. A great cream holder for your lattes or coffee in the kitchen. 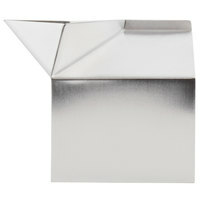 It looks great and will add a stylish look to your kitchen. For easy cleanup, this stainless steel pitcher is super. Some use it to hold cream, I like to use it to hold delicious maple syrup. We use these guys for our espresso pours and they work great! Stainless steel so they withstand all wear and tear. I very much recommend this product.